After a great start to the holiday weekend with temperatures well into the 80's and lots of sun Friday, we unfortunately have some changes on the way with increasing clouds and some potentially strong rainfall ahead of us - especially on Saturday and early Sunday. A storm system and associated frontal boundary is approaching from the northwest, which is drawing winds and humidity from the south - all creating ideal conditions for convergence and heavy precipitation. One of the challenges with this storm system is that it won't push very quickly through the Stateline - it will sit just to our north for a good portion of the weekend causing unstable conditions. 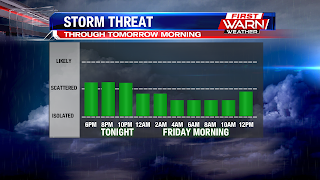 We might see a scattered shower or thunderstorm tonight, but the main event will happen early tomorrow morning - likely between 4 and 6 am - when strong storms and rain showers will approach. 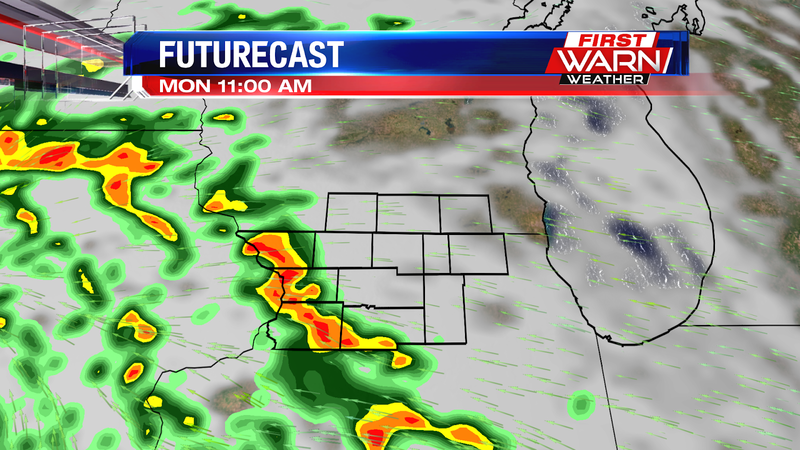 We should see a break mid-day, but then could see another round of storms in the early afternoon. 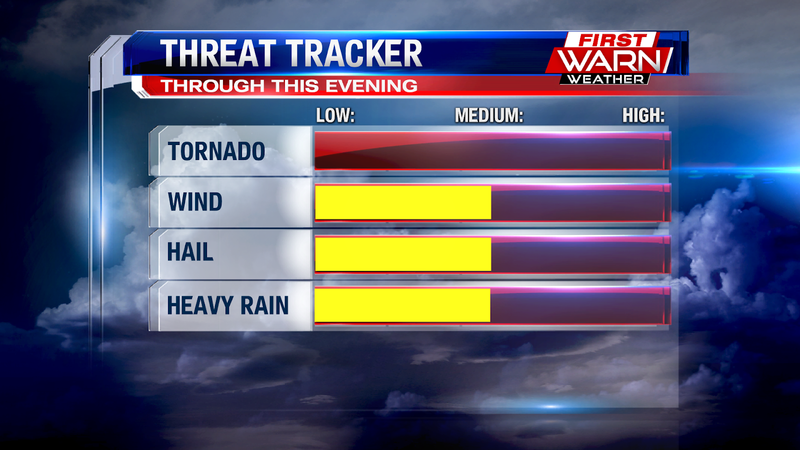 Some of the storms could be severe with strong winds and large hail being the primary threat. 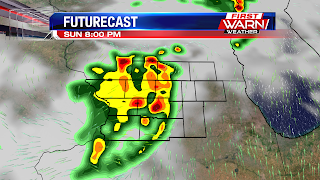 Those storms will continue late Saturday into early Sunday before we get a break by mid-day Sunday. 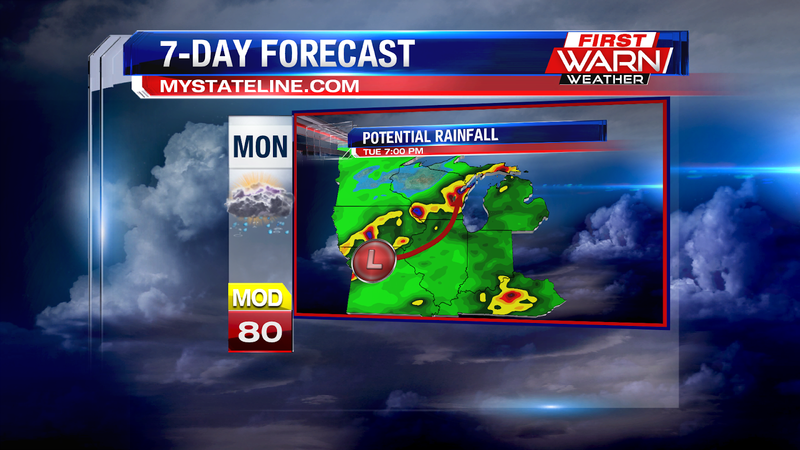 Monday looks a little better as most of the storms will stay to our north. The weekend won't be a complete washout, but we could see times of pretty heavy rainfall. Enjoy your holiday weekend! 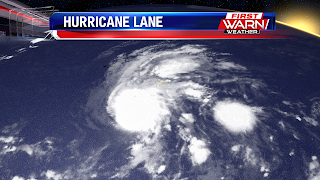 A Stormy Labor Day Weekend? For those of you who enjoyed Tuesday's storms (or for those of you who missed it), then you will certainly enjoy our next round of showers and thunderstorms making their way into the region for your Labor Day Weekend! Long story short; we are going to have a few days in a row in which rain showers and thunderstorms are going to be likely or at least around the area. So what is causing all of it? I shall spare you the weather jargon (for the most part)...but I will still use a little. So here is what is going to be happening. A weakening area of low pressure is moving across upper Minnesota this afternoon and will this evening it will drag a warm front across the area. This warm front will bring those muggy conditions back into the area overnight tonight and just in time for your outdoor plans tomorrow. At the same time, a very slow moving cold front will traverse its way through Minnesota and enter into the upper Midwest by Saturday afternoon, but this is where the weather situation gets a little crowded. A new area of low pressure will develop in Iowa, and this will latch onto the cold front and effectively it will try to pull it back north as a warm front while the other low pressure tries to push it southwards as a cold front. 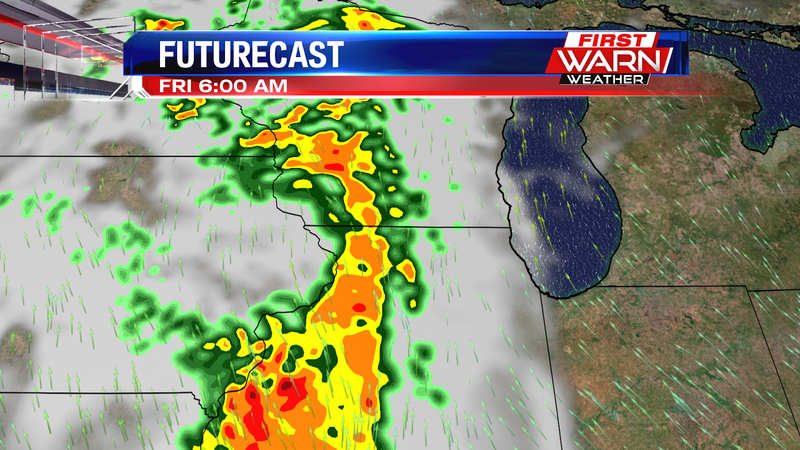 The result: a stationary front that will quickly weaken out by Sunday. This will result in the warmer temperatures and humidity to be in our area with nowhere to go, thus enters the next cold front. This cold front will move with a purpose later Sunday and by Monday morning it will be pushing through Wisconsin. Why does this front matter? Because it will be the thing that tries to get the rain showers and thunderstorms to move out our area. But will it succeed? Only time will fully tell, but right now, it is looking like it will not. 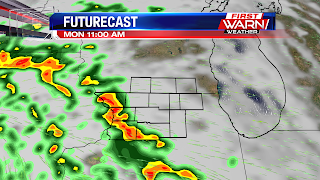 In fact, it is looking like that front will stall out across the Stateline area by Tuesday morning. This means that rain showers and thunderstorms will remain in our area through the start of your work week. The stationary front will get pushed northwards on Tuesday, and this will allow temperatures to rise into the mid to upper-80s for Tuesday afternoon, and combined with the humidity, we could continue to see those rain showers and thunderstorms possibly in our area through Tuesday Night and into Wednesday Morning as well. In fact, it is looking like the chances for rain showers and thunderstorms will be with us until at least Thursday Afternoon. Finally, the way things look is that by Friday this warm front (or quasi-stationary front if you want to call it that) will finally get pushed southwards as a cold front as a fairly decent low pressure moves through Lower Michigan. This means that finally some more inhabitable temperatures (or at least, more autumn like) will arrive into the area by either Friday or Saturday, depending on the exact timing of the cold front passage. Flash Flood Watch now in effect for Winnebago, Boone, Ogle, Lee, DeKalb and McHenry counties until 7am Wednesday morning. The severe threat has ended, however, additional rounds of thunderstorms will continue through early Wednesday morning. 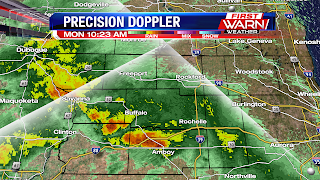 Most of the rain will be moderate, but pockets of heavier rainfall will be possible. We'll begin to see the rain lighten up after 1am/2am Wednesday morning, but additional showers and embedded thunderstorms will continue through daybreak Wednesday. 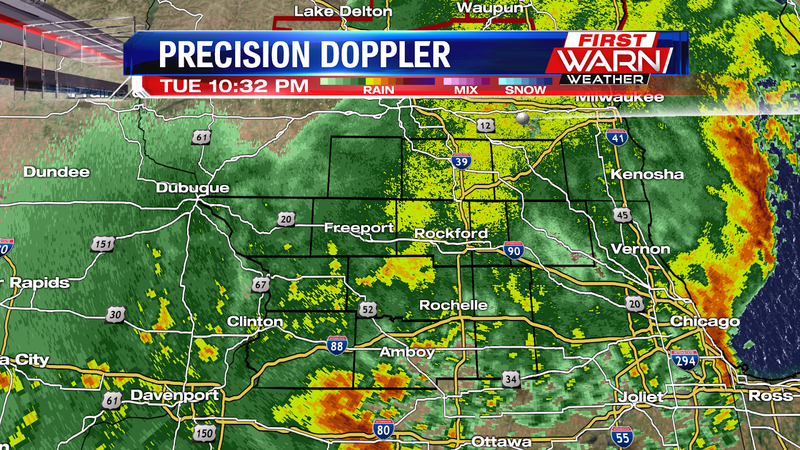 We've received several reports of flooding across Rockford, especially in areas that typically experience flooding. There have also been numerous reports of trees down and power lines down extending from near Roscoe down through New Milford, Byron and Davis Junction. 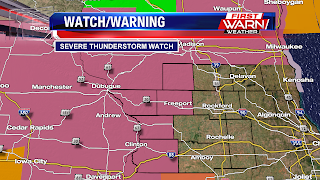 A Severe Thunderstorm Watch has been issued for Stephenson, Jo Daviess, Carroll and Whiteside counties until 11pm Tuesday evening. 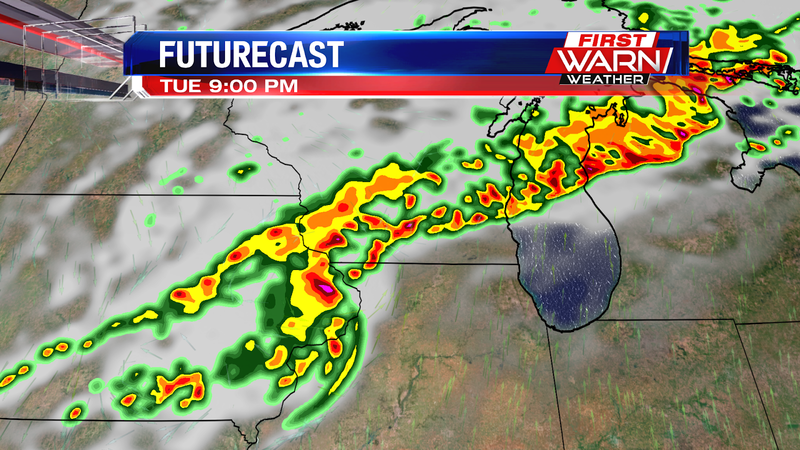 cold front that will move through southern Wisconsin and northern Illinois during the overnight. 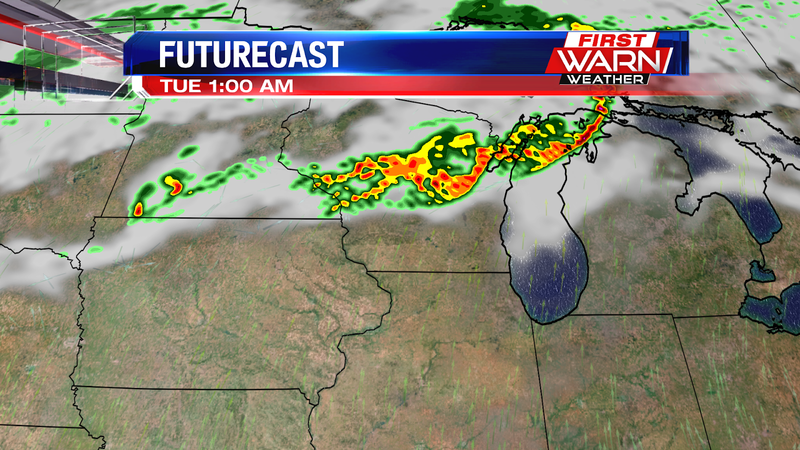 look to be a primary threat initially as the line of storms move in, followed by heavy rainfall during the overnight. Rainfall totals with some of the heavier storms will be between one and two inches. 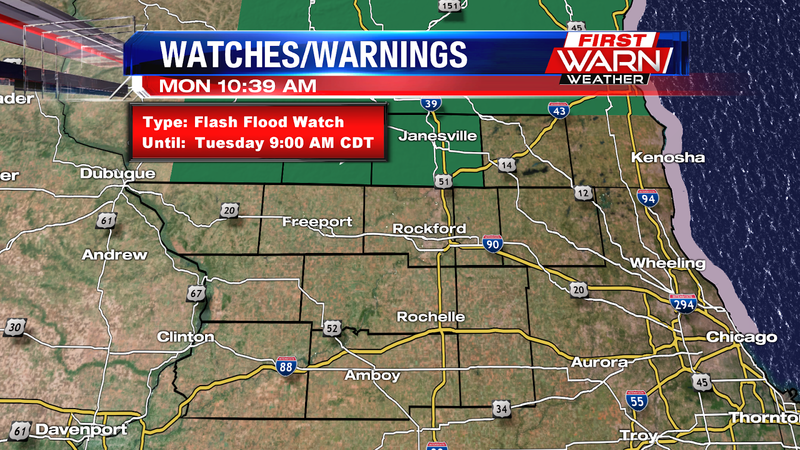 A Flash Flood Watch remains in effect for Stephenson, Jo Daviess, Carroll and Whiteside counties. After a few isolated showers and storms moved across northeast Illinois and southeast Wisconsin earlier this morning, most of the morning and afternoon will remain dry. It will still have a sticky feel though, with dew points in the low 70's. Temperatures will climb into the mid 80's, but the heat index will climb into the mid and upper 90's for the majority of the area. Our main focus today however, will be the thunderstorm potential that continues this evening. 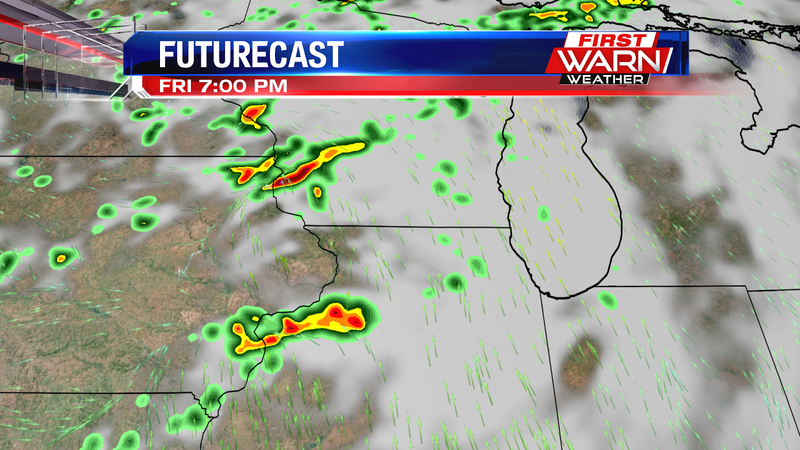 Storms will develop ahead of a cold front to our north and west this afternoon and will approach the area around 5-6PM. A line of storms, and potentially a few lines of storms will dive southeast across the area through the evening tonight. 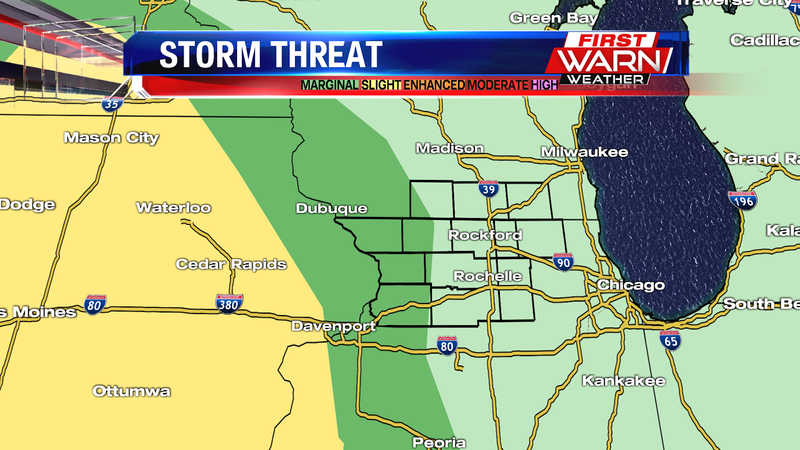 Right now a slight risk for severe storms is over the area, and includes portions of Wisconsin, Iowa, and Missouri. 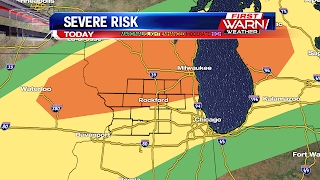 The Storm Prediction Center has upgraded the Rockford area, and portions of southern Wisconsin to an enhanced risk of severe storms. Storms could pack a punch with strong straight line winds, hail, and very heavy rain. Instability soars this afternoon, which would support thunderstorms across the area through the evening. 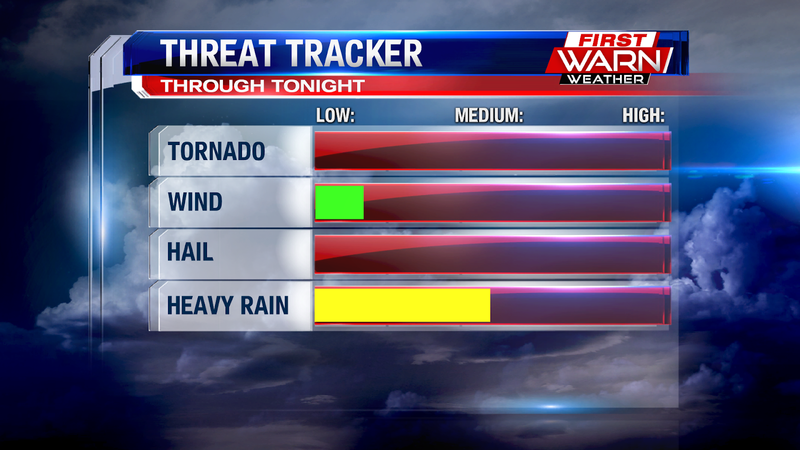 Once the severe threat dies down tonight, the heavy rain threat will linger overnight. 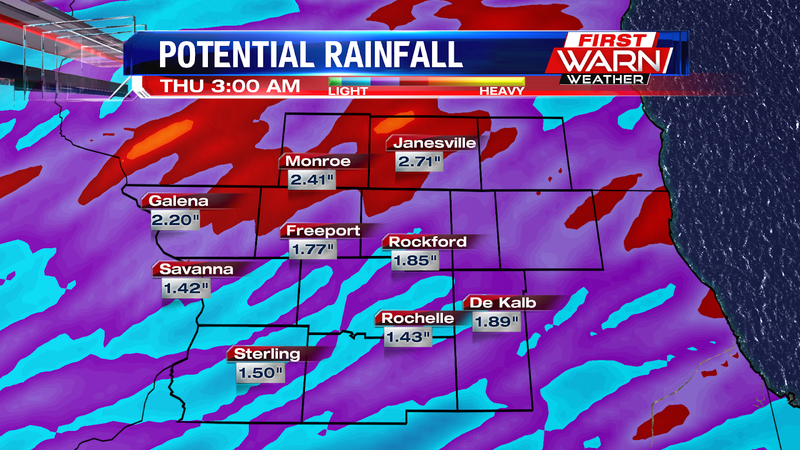 Forecast rain totals now sit around 1-2.5" possible, though some localized higher amounts will be possible. We will need to monitor for the potential for localized flash flooding tonight. When the cold front passes Wednesday morning, showers should exit the area as drier air tries to work it's way in. Clouds will be slow to disperse Wednesday afternoon, but more sunshine is expected Thursday. Check back later for updates on storm potential tonight, and make sure to have a way to receive any watches or warning if we should get them. 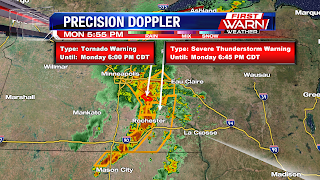 Severe thunderstorms have been ongoing over Minnesota and Wisconsin Monday evening with numerous severe thunderstorm warnings, and even a couple tornado warnings. 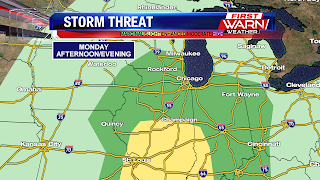 Southerly winds in the atmosphere will keep the storm threat north of the state line, with only a small chance for storms clipping parts of northern/northeast Illinois by Tuesday morning. Severe storms will continue to move east into central and northern Wisconsin Monday night, posing a wind and heavy rain threat. Closer to the Stateline strong southerly winds will keep temperatures in the mid 70's overnight with partly cloudy skies. A cold front moving in from the northwest Tuesday afternoon will allow thunderstorms to once again develop over Wisconsin. 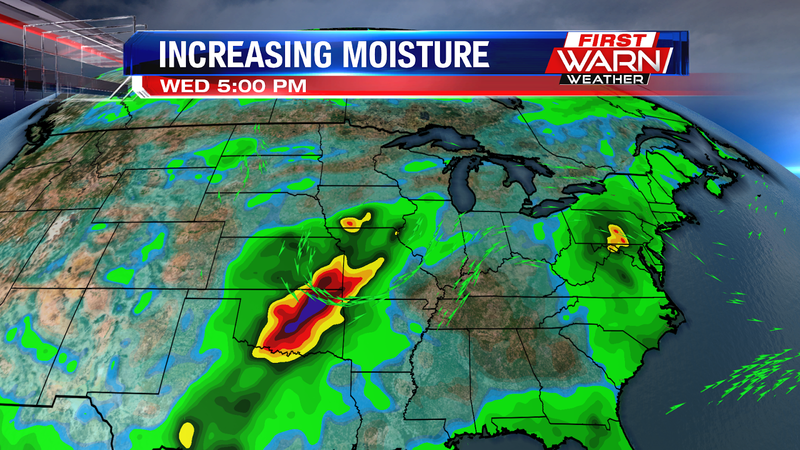 The high moisture in the air will cause instability to build quite a bit during the afternoon Tuesday. Temperatures will warm into the mid 80's, but the heat index will be pushing could be pushing the mid and upper 90's. morning, most of the early afternoon is looking to be dry. 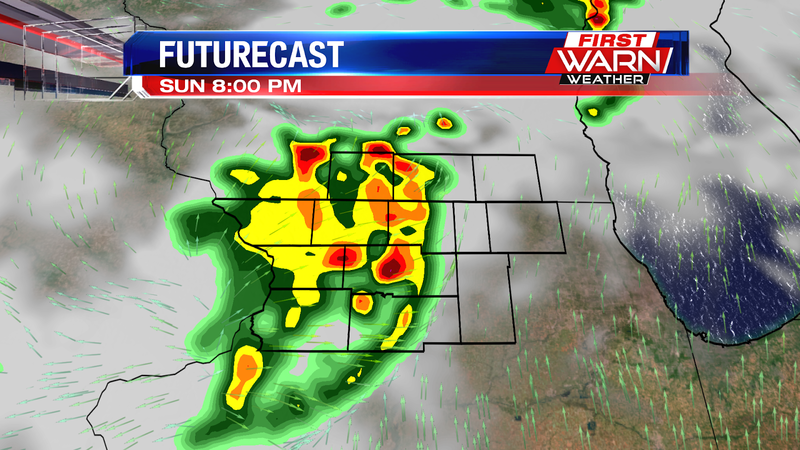 By late afternoon, after 4pm, storms will be possible stretching from Wisconsin down into Iowa. 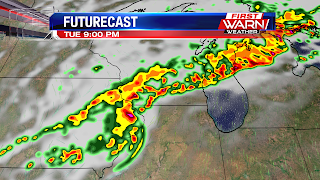 A line of thunderstorms will then develop along and ahead of the advancing cold front, pushing into southern Wisconsin and northern Illinois between 7pm and Midnight. Damaging wind gusts will be our primary concern, followed by very heavy rainfall. 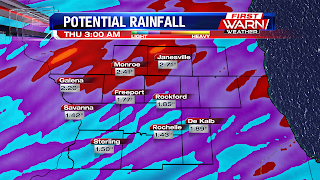 Rainfall totals could add up to two inches in some locations through Wednesday morning. 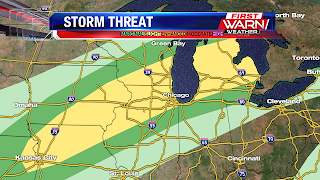 The Storm Prediction Center has placed southern Wisconsin and northern Illinois under a Slight Risk for strong to severe storms for the afternoon and evening Tuesday. A few showers are working their way into the northwest corner of the Stateline this morning, mainly in Jo Daviess county. While there is a chance for a few showers or storms, the bigger story for today will be the continued heat and humidity for the Stateline. 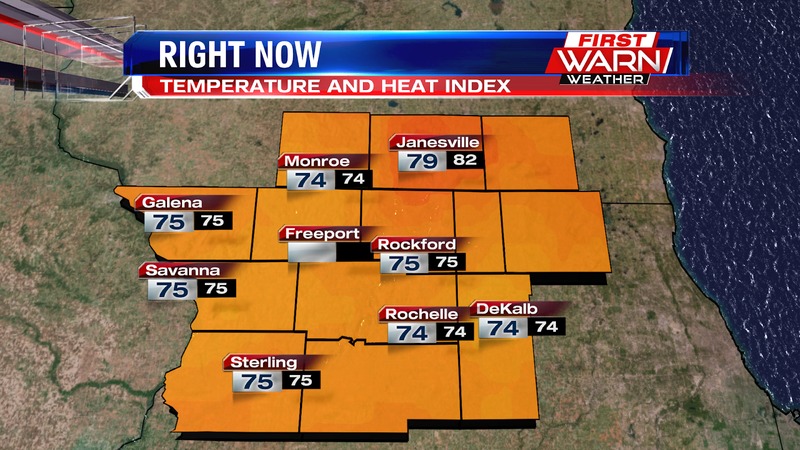 It is a very muggy and warm start to the day, which will really help temperatures to spring board for the afternoon. 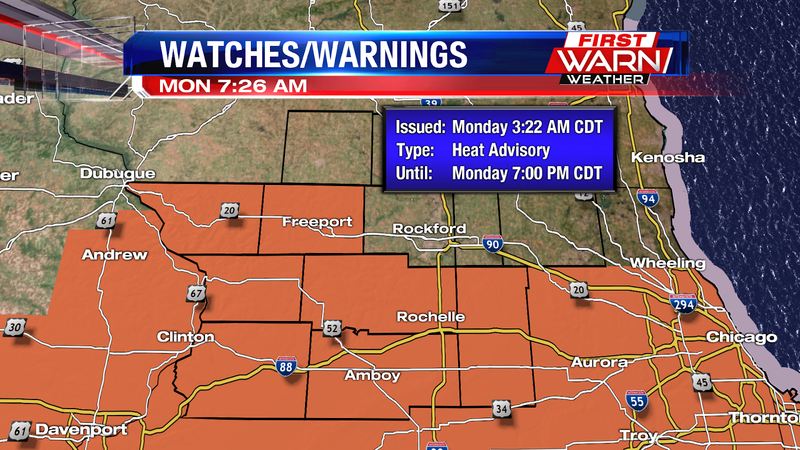 Yesterday's Heat Advisory has been expanded and extended for today. 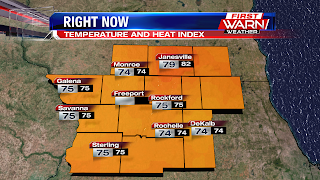 Jo Daviess, Stephenson, Carroll, Whiteside, Ogle, Lee, and Dekalb counties are all under a Heat Advisory until 7pm this evening. These areas will most likely see highs near 90° but heat index values will soar as high as 105° this afternoon as dew points sit in the low 70's! Once dew points hit about 69° to 70° the humidity enters the "oppressive category." These areas will be a touch warmer this afternoon due to a bit more clearing of the morning cloud cover; while areas near the Wisconsin border and northeast Illinois should keep a bit more of the clouds, and thus will be slightly cooler. This would keep highs mainly in the upper 80's, with heat index values approaching the mid and upper 90's; not quite heat advisory criteria. Still, remember to practice those heat safety tips! Drink lots of water and stay hydrated, wear light colored and loose fitting light clothes, check on your kiddos and furry friends, and take frequent breaks if you have to work outside today. It will be slightly cooler tomorrow, but just as humid. Temperatures will reach the mid 80's with heat index values in the mid 90's for the afternoon. A cold front will bring the threat for storms Tuesday, but also a break from the heat and humidity Wednesday through Friday. 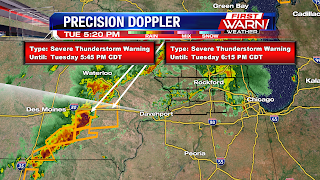 Severe Thunderstorm Warning canceled for Winnebago, Rock and Walworth counties. 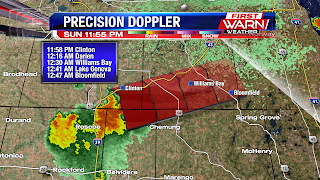 (11:59:12 PM) nwsbot: Local Storm Report by NWS LOT: 4 ENE Pecatonica [Winnebago Co, IL] law enforcement reports TSTM WND DMG at 11:38 PM CDT -- tree and a large branch downed near the same area. time estimated per radar. Severe Thunderstorm Warning for Rock and Walworth counties until 12:30am. 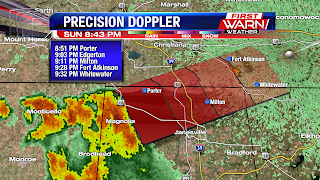 Strong thunderstorm moving out of Winnebago County and into southeast Rock and Walworth counties will have the potential for strong winds, frequent lightning, small hail and heavy rainfall. 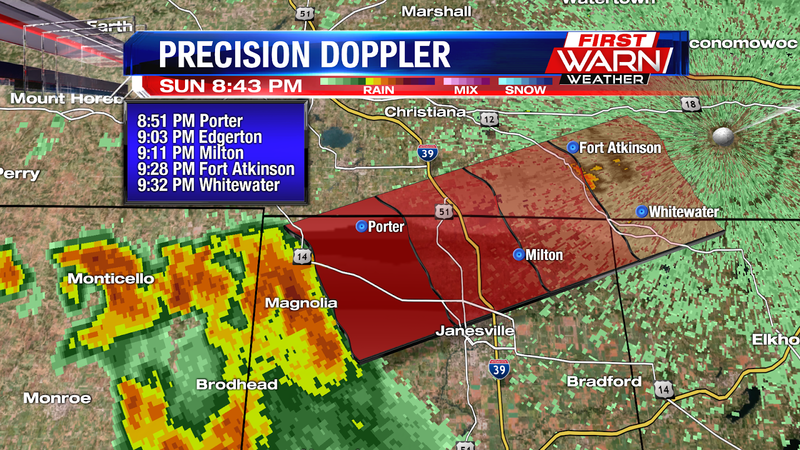 Storm is moving to the northeast around 35 mph. 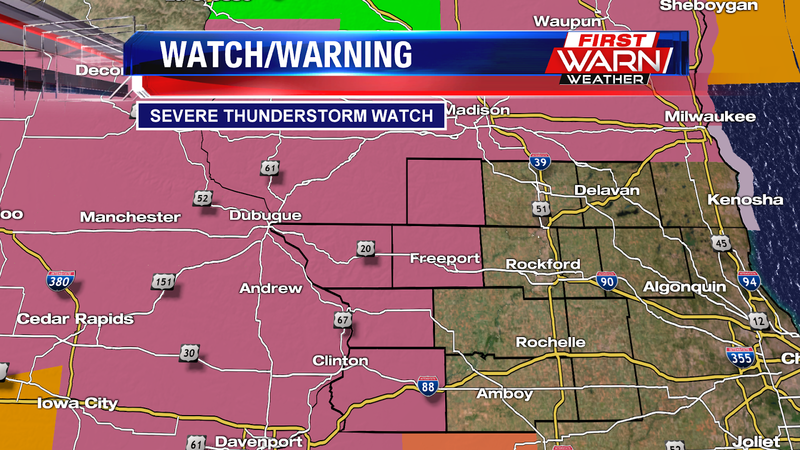 9:20pm Update: Severe Thunderstorm Warning canceled for Rock County. Thunderstorms will remain isolated through the overnight. 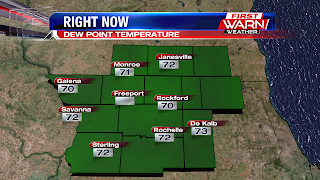 Warm and muggy with temperatures in the low 70's. 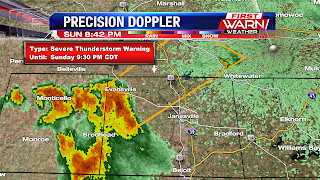 8:45pm Update: A Severe Thunderstorm Warning has been issued for northwest Rock County in southern Wisconsin until 9:30pm. The storm was located near Evansville, and moving northeast around 40 mph. 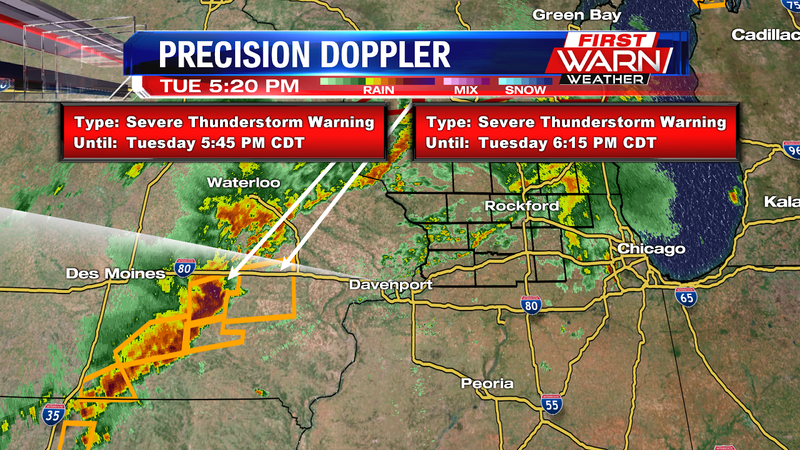 This storm will be capable of 60 mph wind gusts and dime sized hail. 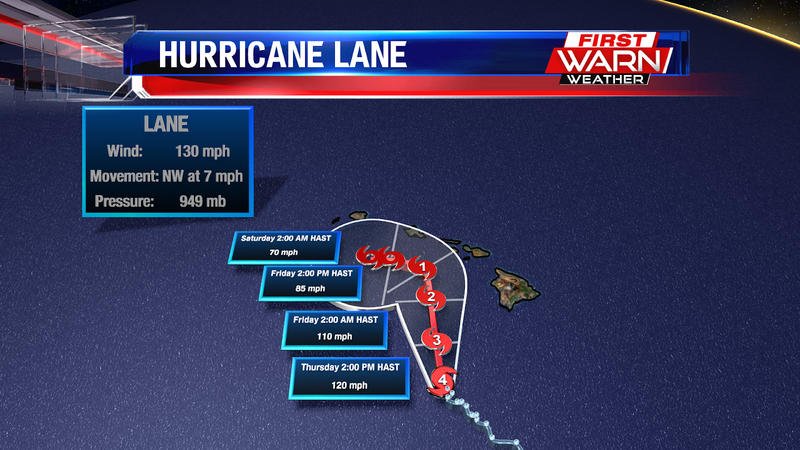 Heads up if in the path of the storm. Seek shelter inside and away from windows until the storm passes. Temperatures Sunday afternoon warmed into the upper 80's and low 90's, but the heat index made it feel more like the low 100's in some locations. 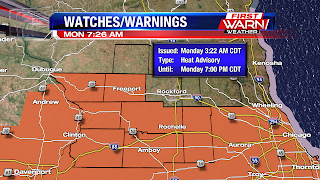 A Heat Advisory remains in place for Stephenson, Jo Daviess, Carroll and Whiteside counties through 7pm Monday evening. Skies over northern Illinois have stayed mostly dry, but thunderstorms quickly developed over central and southern Wisconsin Sunday afternoon. 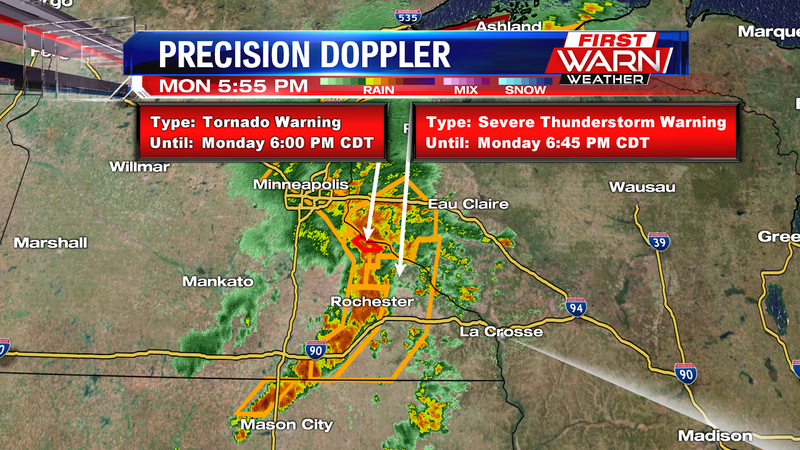 Numerous severe thunderstorm warnings were issued with reports of wind damage in central Wisconsin. 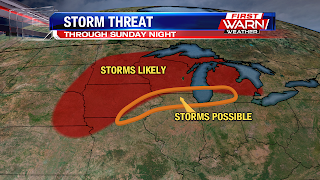 Most of the storm activity will remain to the north in Wisconsin Sunday evening, but a few isolated thunderstorms may develop further south in northern Illinois. and Monday morning. Any storms that do develop would mostly pose a heavy rain threat with secondary threats being wind and hail. 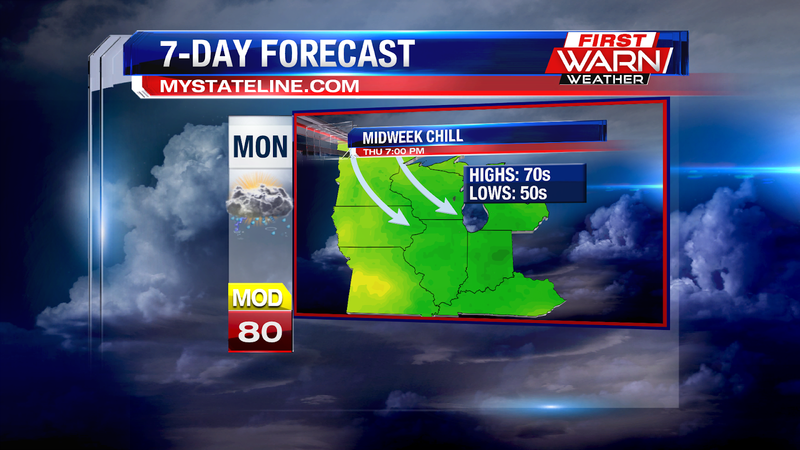 It has been a fall-like Friday for the Stateline. It's been cloudy, foggy, soggy, and quite cool with temperatures remaining in the 60's through the afternoon and evening. Along with that, it's been quite breezy too, with southerly winds sustained near 10-20mph, adding to the fall feel. Drizzle and scattered showers have been persistent this evening, but despite the thick cloud cover a few widely scattered to isolated storms will be possible this evening and overnight. 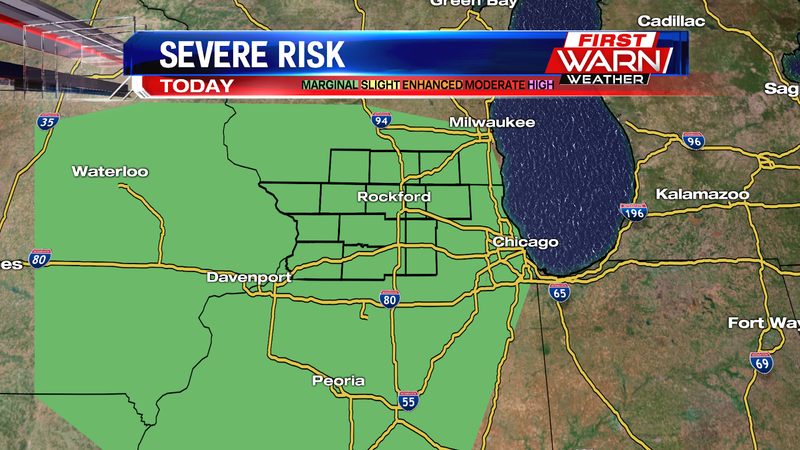 Northern Illinois, southern Wisconsin, and eastern Iowa are included in a marginal risk of strong to severe storms. Through the next couple of hours, some upper level instability will veer into northern Illinois which should help to support a few widely scattered to isolated storms. We'll watch for some isolated heavy rain, and potentially some hail, but the greatest threat should remain west of the Rockford area. The overall severe threat is rather low, with maybe just a gusty storm or two expected. Activity should linger through about 2am before exiting the area. Rain showers are beginning to come to an end late Friday morning with skies staying mostly cloudy during the afternoon and evening. A warm front positioned over Iowa will move into eastern Iowa by Friday afternoon, as low pressure moves across southern Minnesota. 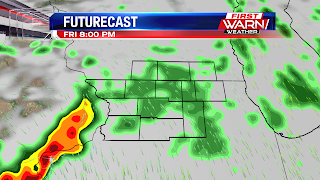 A few scattered showers can't be ruled out over northern Illinois and southern Wisconsin later this evening (and that is possible for some of the Friday night football games), but an increase in storm coverage will be likely over eastern Iowa between 5pm-7pm Friday evening. Cloud cover over the Stateline will keep instability on the lower end during the day, but a warm wind a couple thousand feet above the surface will keep a little elevated instability during the evening and overnight. 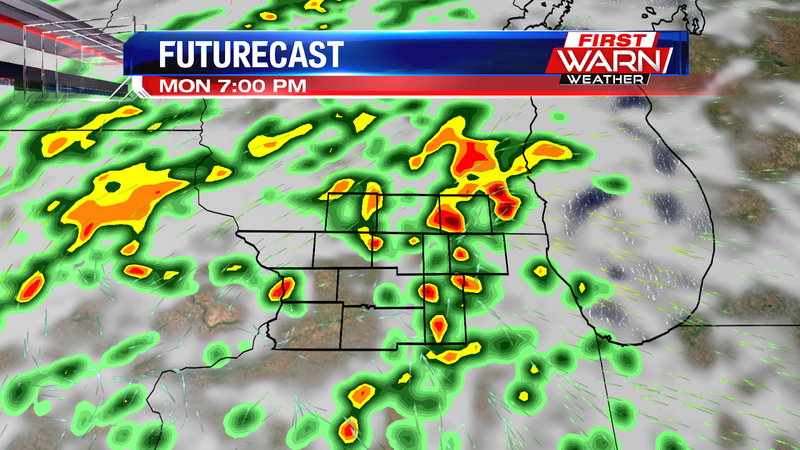 This could help sustain thunderstorms from Iowa as they move into northern Illinois after 8pm or 9pm tonight. The overall severe threat is low, but some of the stronger thunderstorms may be capable of producing large hail and gusty winds. A Slight Risk for severe weather is in place over Iowa, with a Marginal Risk extending into northwest Illinois. 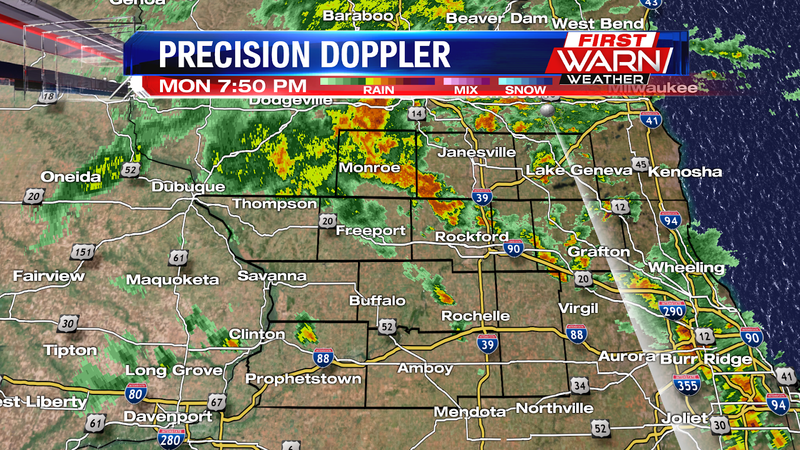 Thunderstorms will then move east over north-central Illinois, reaching Janesville, Rockford and Rochelle by 10pm. Most of the activity will then be to the east after 2am Saturday morning. 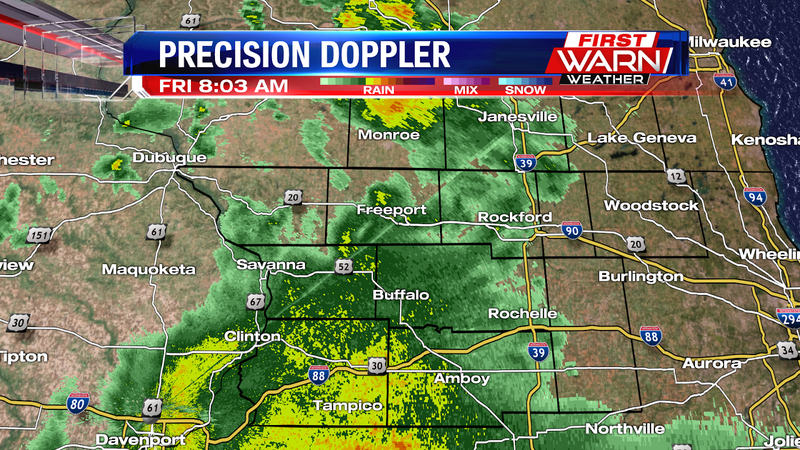 Light to moderate rain continues to move through southern Wisconsin and northern Illinois Friday morning. Heavier rainfall remains over central Illinois, but a few pockets of moderate rain can be expected for some this morning. The back edge of the rain will be east of northern Illinois by 9:30/10:00am, with skies staying mostly cloudy during the afternoon. Rainfall amounts will remain light and under a quarter of an inch, with an exception south of the immediate Stateline. Scattered showers will remain possible through the afternoon, but thunderstorms will be likely later Friday evening and early overnight. portions of Oahu and Kauai. The threat for flash flooding will be increasing in these areas as Lane continues to move closer. 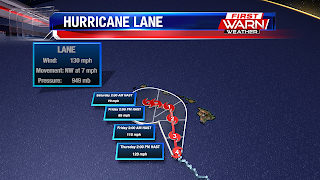 Hurricane Lane will likely bring life threatening conditions across Hawaii with damaging winds, dangerous surf, coastal storm surge and intense flooding rains through Saturday. Lane will begin to weaken soon and will continue to weaken over the next several days. So far as much as 9-12" of rain has fallen over the Big Island over the past 12 hours! Temperatures Wednesday warmed into the mid and upper 70's, following a chilly start in the morning. Clearing skies Wednesday night will allow temperatures to once again fall into the low 50's by the start of Thursday. High pressure overhead Thursday afternoon will keep skies mostly clear through much of the day. Cloud cover will be on the increase Thursday evening and night, ahead of a warm front that will move into eastern Iowa by Friday morning. Ahead of the front, heavy rainfall and embedded thunderstorms will develop, moving into northern Illinois and southern Wisconsin by daybreak Friday. Most of the rain will be to the east by late morning, with a little more dry time for the afternoon. Cloud cover sticks around and this will hold temperatures in the mid 70's throughout the day. 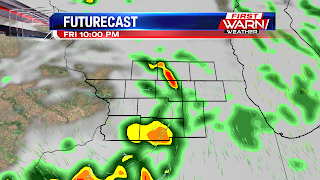 By Friday afternoon and evening, stronger thunderstorms will be possible over eastern Iowa and southwest Wisconsin, especially if skies clear out following the rainfall in the morning. Further east, there remains a threat for isolated showers/storms for the start of the first Friday night high school football games. But it looks like an increase in some of the rain may actually occur late Friday evening, after 9pm. Heavy rain producing thunderstorms continue to lift north into Wisconsin Monday evening. While the overall severe threat remains low, the heavy rain threat is still pretty high - especially with storms lifting into southwest Wisconsin. The majority of the heavy rain, and flooding, has been occurring in Wisconsin but I did receive a report of nearly four inches of rain in Orangeville. 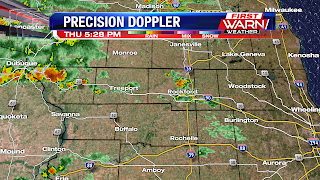 Thunderstorms passing north of Rockford will continue to lift north into Wisconsin, with more widely scattered activity during the overnight. Low pressure currently moving through southeast Iowa will pass over northern Illinois tonight before shifting east by Tuesday morning. 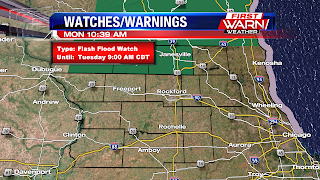 A Flash Flood Watch has been issued for Green and Rock counties in southern Wisconsin, through 9am Tuesday. This area has already been battered by several rounds of heavy rain late last week, and with the potential for more heavy rain this afternoon and evening some localized flooding will be possible. 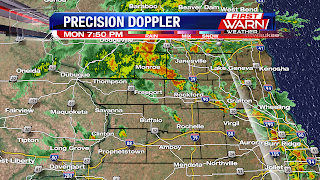 Heavy rain is currently falling near Amboy and through portions of Carroll and Jo Daviess counties, and will continue to lift northward. 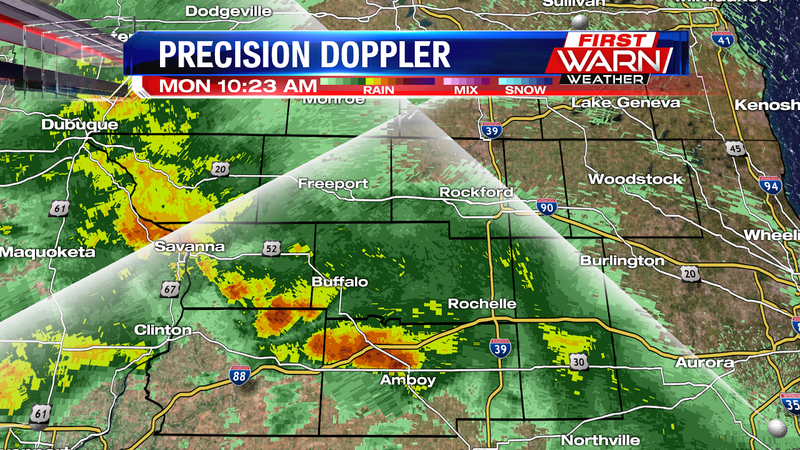 there hasn't been much lightning detected, but you'll want to watch for ponding on some area roads. This first wave of rain will move out of the area this afternoon, but behind it we will need to keep an eye on any potential clearing of the cloud cover. If we get the sun to mix out the clouds, it could allow for enough destabilization to occur which would lead to more instability. If we get enough instability then this could prompt a few stronger storms for portions of the Stateline area this afternoon. If the warm front lifts far enough north, then it is also possible for a spin up weak tornado or two. The atmospheric conditions however aren't conducive for any long lived strong tornadoes. The threat for heavy rain will continue into the afternoon and evening, with many receiving .25" to .75" inches of rain, though some localized higher totals are possible. The coverage of showers and storms will decrease tonight into Tuesday, though can't rule out a few showers and storms Tuesday afternoon. A strong area of low pressure to the west will bring an increasing chance for thunderstorms Monday afternoon and evening. 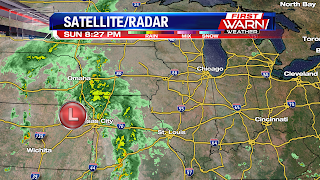 Showers and thunderstorms have been ongoing over the Plains as low pressure moves into northern Missouri. Severe weather has been occurring in parts of Missouri and Arkansas Sunday evening, and will remain well south Sunday night. 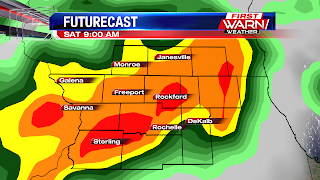 As a warm front lifts closer to northern Illinois Monday morning, showers and embedded thunderstorms will increase in coverage from southwest to northeast between 7am and 10am, overspreading much of northern Illinois by Noon. A break from the rain and storms may occur early afternoon, also allowing for a brief break in cloud cover. If clearing is significant enough, instability will rise causing a higher threat for storms - some strong to severe - by the afternoon and evening. 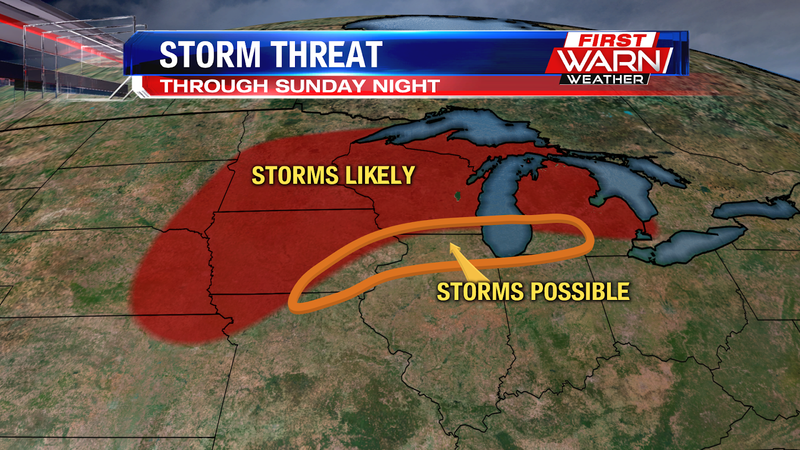 As of Sunday night it looks like the greatest threat for severe weather will occur over central Illinois. 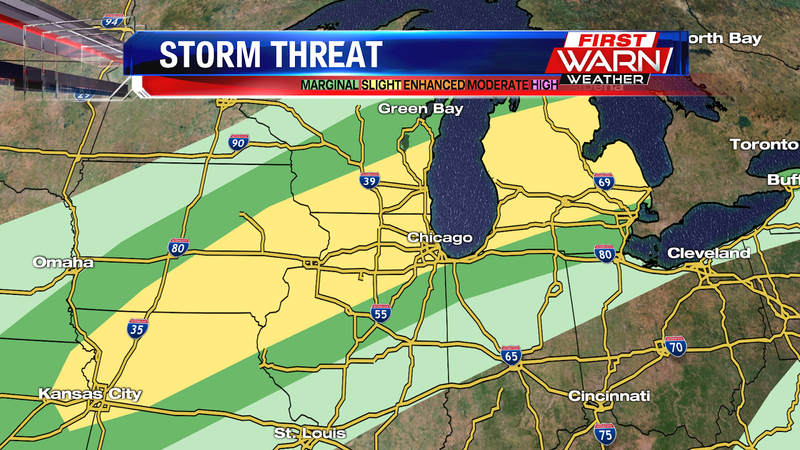 But a warm front lifting close to the I-80 and I-88 corridors could bring the threat for strong to severe storms northward. If that occurs supercell thunderstorms may form increasing the chance for large hail, but also an increased threat for isolated tornadoes right along the warm front. 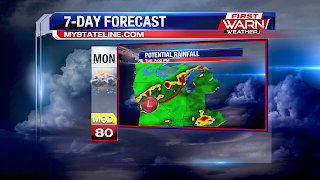 Thunderstorms will remain scattered throughout Monday night, before becoming more isolated by Tuesday morning. Following heavy rainfall Thursday night, the majority of Friday afternoon and evening remained dry. As skies clear out following the passage of low pressure, locally dense fog will be possible by Saturday morning. High pressure will move in Saturday and Sunday, leaving skies mostly dry and partly cloudy. A weak disturbance moving through the jet stream Saturday may be just enough to generate an isolated shower Saturday afternoon, but most should remain dry. Highs both days will warm into the low to mid 80's. 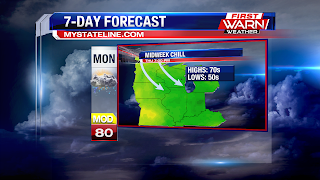 Low pressure will quickly move in from the southwest late Sunday night and throughout the day Monday. Increasing moisture will allow rain to develop as early as Monday morning, but likely become more widespread by the afternoon and evening. Heavy rainfall will be possible during that time, with potentially another one to two inches of rain falling across the Midwest. But the track of the heaviest rain will depend on the exact track of the low pressure system. Either way it looks to be a soggy start for kids heading back to school Monday. Following the passage of the low Tuesday, winds will increase from the North Tuesday, pulling down a slightly cooler air mass for the middle of the week. Temperatures won't be terribly chilly, but highs in the mid to upper 70's will be possible with overnight lows dropping back into the 50's. It'll be nice to turn off the A/C and let a little fresh air inside. The cool down is short-lived because it looks like temperatures will warm back into the 80's by the end of next week. 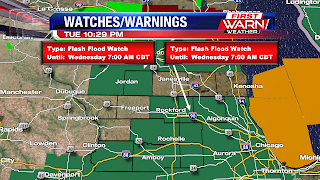 A Flash Flood Warning has been issued for northeast Rock County until 3:15am Friday. Several roads in Milton have been reported closed or impassable due to flooding. Up to three inches of rain has fallen in that area, with an additional one to two inches possible. 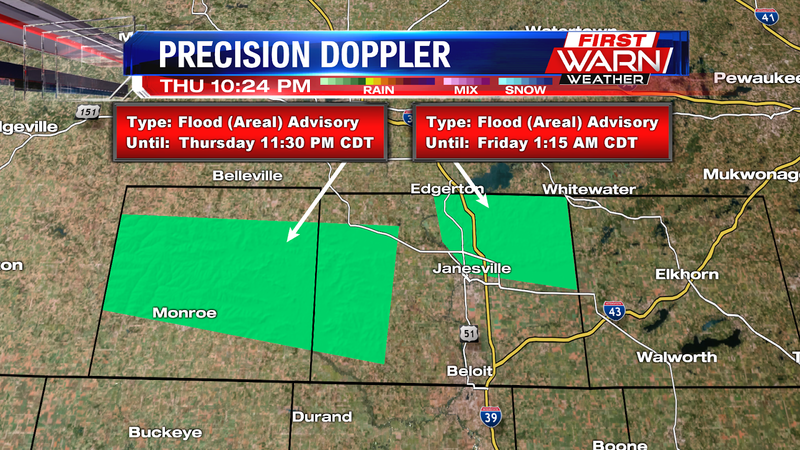 Flood Advisory remains in effect for northeast Rock County until 1:15am and for western Rock and Green counties until 11:30pm. 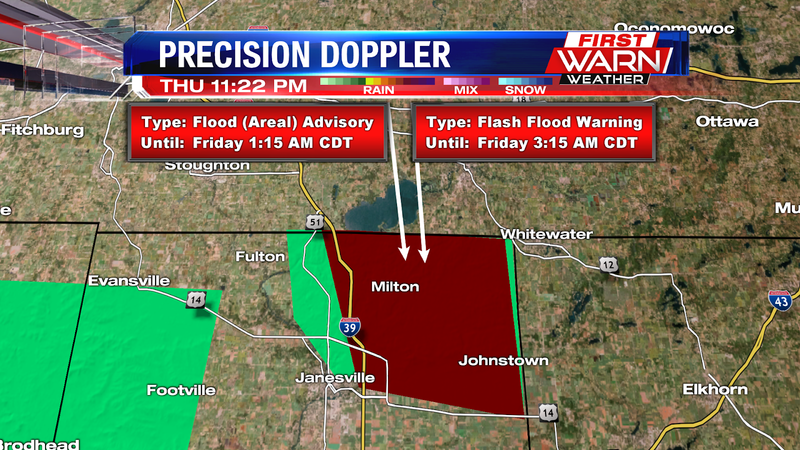 Flooding has been reported around Edgerton, WI with street flooding throughout town. Showers and isolated thunderstorms have increased in coverage late Thursday afternoon as low pressure moves closer to northern Illinois. Widespread rain and thunderstorms have been ongoing over Wisconsin and Iowa, closer tied to the low pressure system. Not everyone will experience the rain Thursday evening, and several locations could end up dry but where the rain does fall, heavy downpours will be possible. There is a risk for stronger thunderstorms, mostly along Whiteside and southern Lee counties where stronger thunderstorms could produce gusty winds. 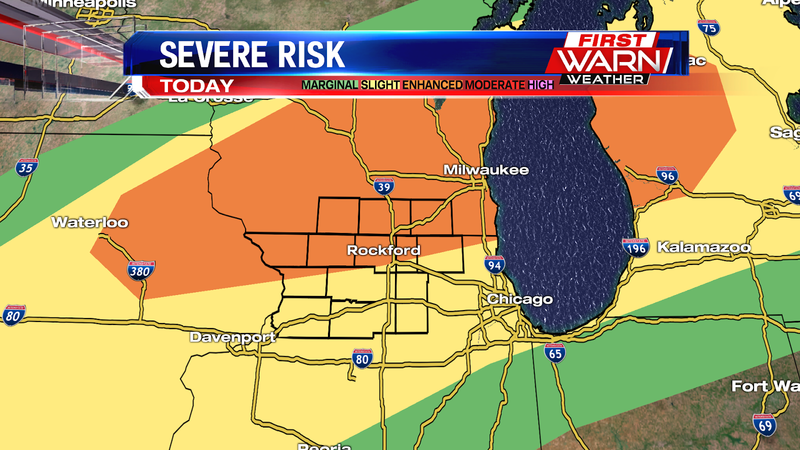 But a higher threat remains further downstate. In fact, there was a Tornado Warning southwest of Peoria earlier Thursday evening. 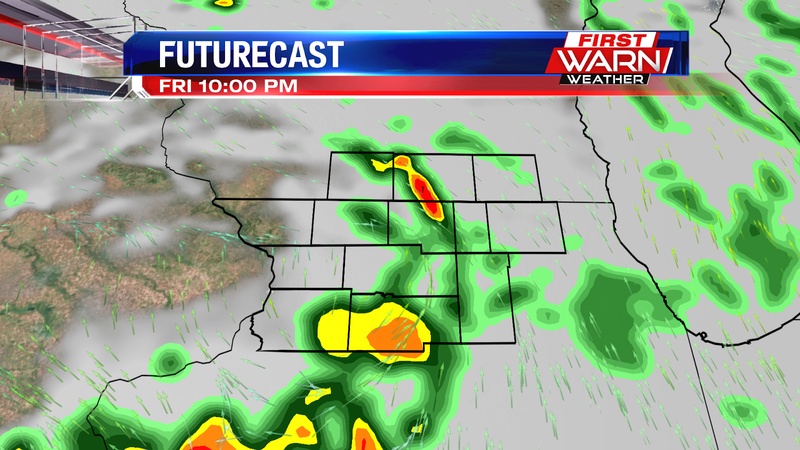 As the low passes northern Illinois Thursday night showers will remain possible into Friday morning. Fog will also be possible again for the commute. 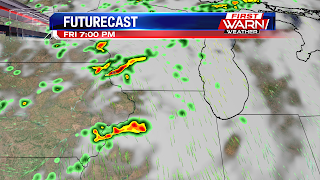 As the low moves a little further to the east during the day Friday, isolated showers and thunderstorms will develop with the heating of the day. Drier air with high pressure arrives by Friday night which will help clear our skies for the weekend. You'll need the low beams on and to take is slow this morning! A Dense Fog Advisory is in place for the majority of northern Illinois and southern Wisconsin, as visibility drops to near a quarter of a mile for many across the area. Visibility can change quickly as you drive, so you'll want to take it slow this morning, especially in outlying and low lying areas. 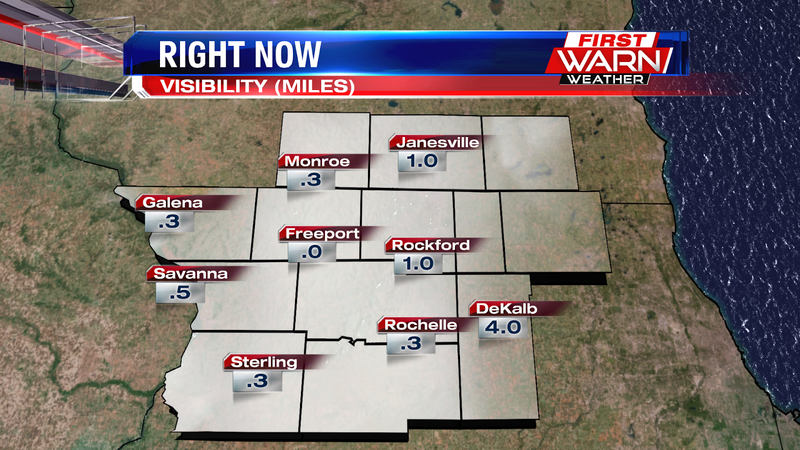 Some visibility dropping to just a few hundred feet! Low beams are a must, and make sure to not use high beams, because they will hit the fog and reflect back. The fog should begin to burn away by 9am with more sunshine. Very isolated showers developed Sunday afternoon along a surface boundary. 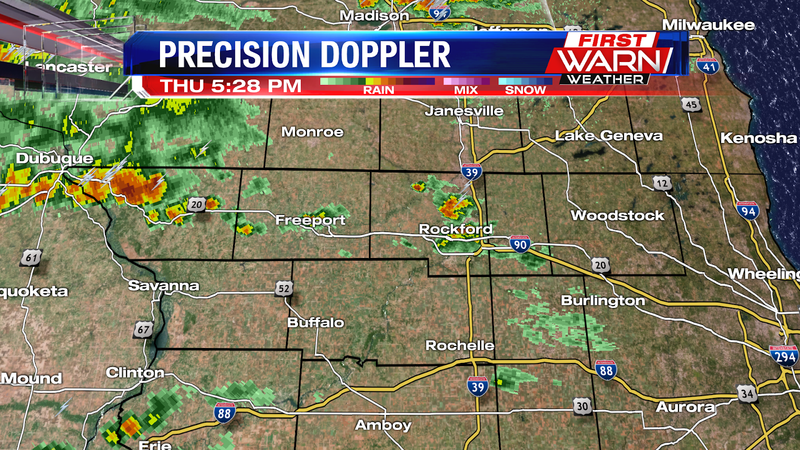 The rain didn't amount to much, but did bring quick downpours and even a few funnel clouds over DeKalb County. Showers still linger over Lee County Sunday evening as a hazy sunset begins. A little more haze and smoke was seen Sunday afternoon in Wisconsin and Illinois from the wildfires burning in Canada and along the west coast of the U.S. Actually, quite a bit of the country is experiencing hazy skies Sunday and will likely continue to do so through Monday evening. system will bring widespread and heavy rainfall over the central and southern Plains Tuesday afternoon. 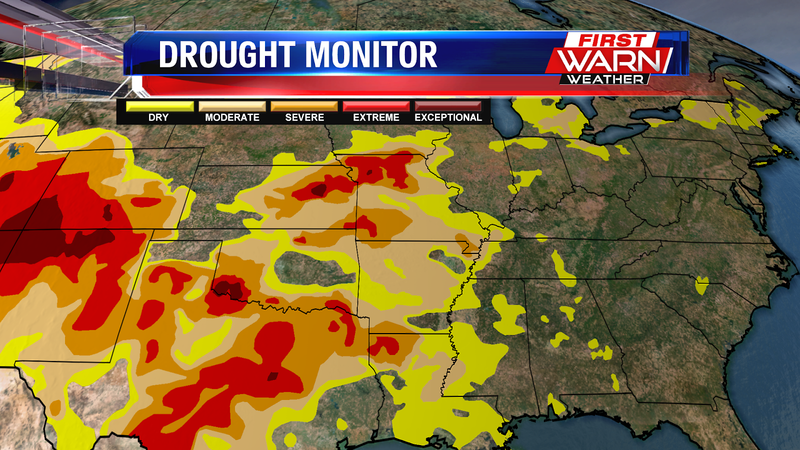 Much of that area is experiencing significant to exceptional drought conditions, and the increase in heavy rain could lead to flooding issues over the next couple of days. 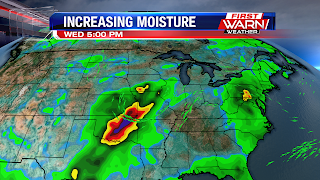 As the low moves into Missouri and Illinois by Wednesday, moisture will be pulled northward. A warm front will lift into northern Illinois late Tuesday night and remain just to the south during the afternoon Wednesday. Scattered showers will be likely as early as Tuesday evening, but most likely by Wednesday morning. Depending on exactly where the boundary ends up, widespread rain could fall over northern Illinois through Wednesday night. Rainfall totals of half an inch, up to an inch are possible. Isolated showers and thunderstorms will be possible Thursday, with isolated showers potentially lingering into the weekend.